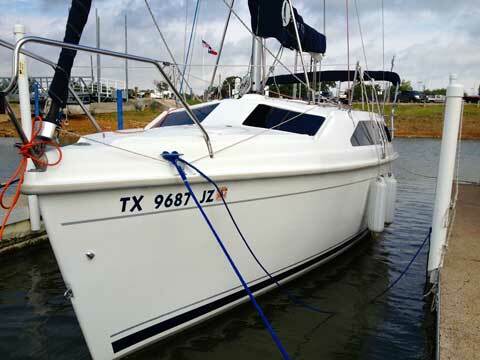 Price includes the slip and trailer parking until March of 2014. Large cockpit with storage, walk through transom with fold down telescoping SS ladder, stern rail seats and bimini top. This is most beneficial when maneuvering in the marina or when loading on the trailer. For quick reference, there are Raymarine ST40 knot and depth meters on starboard bulkhead and Danforth bulkhead compass on port. All lines are led aft into the cockpit to help support short handed cruising. Ronstan tiller extension. There are a nice set of soft cockpit cushions and exterior speakers. The anchor resides in the anchor locker along with its rode. She has a fractional B&R rig with no backstay and a smaller jib. 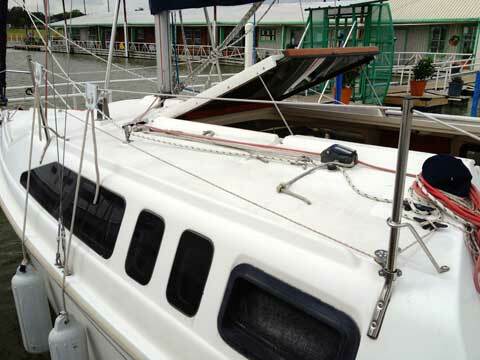 The powerful main has a large roach and has two reefing points. The 260 really handles nice when tacking up wind. The jib is on a CDI furling system with blue Sunbrella UV protection. The two Lewmar #6 winches are great for sheeting the jib or raising a halyard. The main sail is housed in a matching Sunbrella cover. 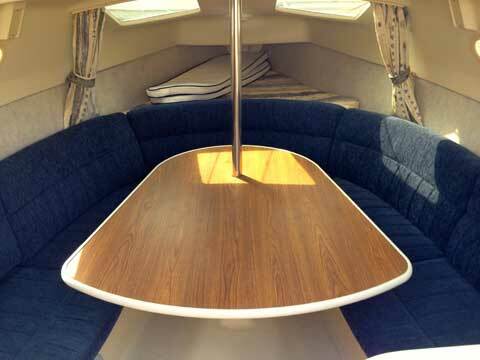 The companionway is secured by heavy plexi sliding top hatch and plexi and teak hatch boards. Forward, the hatch opens and tilts to a 45 degree angle for more walk around room below. The aft berth is roomy with a large opening overhead hatch. Sony CD receiver. Shore power with outlets. 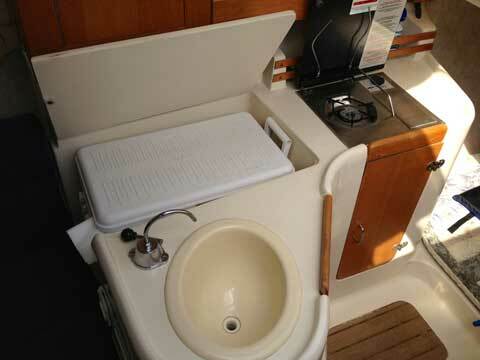 The head is private with door, marine toilet with holding tank, sink and vanity with mirror and additional storage. The salon incorporates a luxurious wrap around settee with ample storage under. The salon table rotates 180 degrees for more walk around space. Interior cushions are covered in a nice dark blue upholstery. Overhead, there are two large deck windows for light or viewing the rig while under sail. The V berth also has a large opening overhead hatch for maximum airflow. The galley is functional with below counter ice box and storage, sink and propane stove by Kenyon. Also included is the tandem axle galvanized steel trailer with surge brakes and the Honda 9.9 hp electric start, 4 cycle outboard with quick disconnect steering link to rudder post. 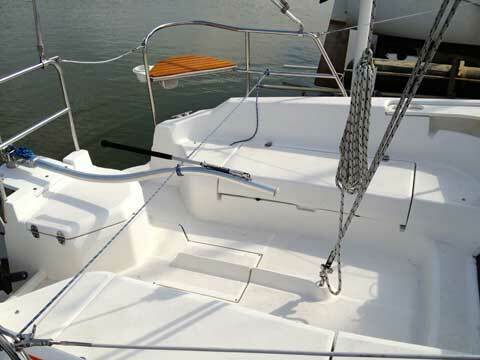 The Hunter 260 is about the largest truly trailerable sailboat available. From the highway to the waterway in about 30 minutes, single handed. It is cruising in maximum comfort.